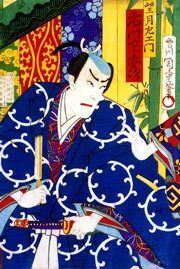 Kawatake Mokuami's Nagauta-based matsubamemono "Imayô Mochizuki" (commonly called "Mochizuki") was premiered in June 1882 at the Saruwakaza [casting]. 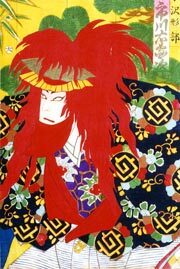 Shiragiku, the widow of Yasuda no Shôji Tomoharu and her son Hanawaka are travelling all over Japan to seek out Mochizuki no Saemon Akinaga, who has murdered Yasuda Tomoharu and was responsible for the fall of the Yasuda clan in the province of Shinano. One cold winter night, in the city of Moriyama in the province of Ômi, they stop for a rest at the Kabutoya, an inn which is, by chance, managed by Ozawa no Gyôbu Tomofusa, who is a former servant of Yasuda Tomoharu. By another trick of fate, Mochizuki Akinaga also seeks shelter at the Kabutoya that same night. 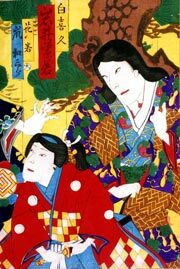 The proprietor informs Yasuda's okugata and Hanawaka of the opportunity to take revenge by striking Mochizuki Akinaga. He promises to do his best to help them. Ozawa Tomofusa's plan is quite simple: he introduces the mother and her son to Mochizuki Akinaga's room, disguised as a goze and her child attendant. Mochizuki Akinaga accepts to be entertained with wines, songs and dances. The highlight is a shishimai dance perform by Ozawa Tomofusa. After a while, Mochizuki Akinaga drowses with pleasure. Seeing him drowsing, Ozawa Tomofusa helps little Hanawaka to avenge his father's death.